It’s been a hot second since I’ve read a YA book (the last one was Piratica in April, and it was both terrible & not worth discussion). I like to use them as palate cleansers between more hefty books, not because I think YA is frivolous, but because the writing itself tends to be less dense and easier to digest than “adult” books, which is a nice chance of pace. In pursuit of such a break after two months of some pretty heavy reading, I decided to exercise my new Seattle Public Library membership and picked up Nnedi Okorafor-Mbachu’s Zahrah the Windseeker. It turned out to be pretty excellent and probably you should read it. I’ve read one book by Nnedi Okorafor before–Who Fears Death?, which is intended for adults and definitely deserves the “adult” label. That book is graphic to say the least, and it uses its violence in really intelligent, unflinching ways, making for an intense yet meditative read. I was really interested to see how someone who wrote a book like that would adapt to the YA genre, where violence and death aren’t strangers, but they aren’t particularly welcome, either. Turns out, in this case, she adapted really well. Zahrah the Windseeker is set in a fantasy/scifi world where technology is rooted in plant life (computers are grown, “lamps” are actually glowing flowers, etc. ), and the known world of human settlement is surrounded on all sides by the impenetrable and much-feared Greeny Jungle Forest. Our protagonist, Zahrah, is a young girl born with vines in her dreadlocks, making her “Da-Da”–a variety of person thought to be mythical in some areas, who sometimes have magic powers. Zahrah’s Da-Da-ism (no relation to the art movement) makes her a target for exclusion by other kids, but it also grants her wisdom and power, which she must learn to use on her epic journey through the Greeny Jungle Forest to fight a great monster and save her best friend Dari. 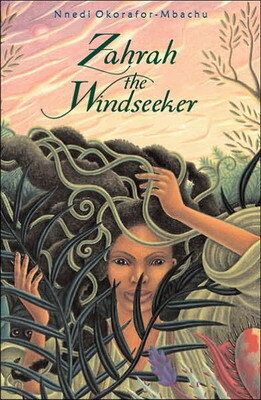 At its heart, Zahrah the Windseeker is a classic hero’s journey tale. Zahrah lives happily if not entirely accepted in one world, and then is dragged out of it by Dari’s adventurous nature, and eventually has to venture into a new and dangerous world on her own, ultimately mastering it through a series of challenges, then returning to her home having mastered even herself. It’s that last part that really sold the story for me; Zahrah starts off with the typical boring Protagonist personality, surrounded by more interesting people, but then her journey through the forest forces her to discover herself, and her entire character shifts into this incredibly interesting, resourceful, determined person whom I would gladly read another book about. So often protagonists, especially YA protagonists, suffer lack of personality for the sake of outside plot forces, but Zahrah really does drive her own story, resisting happenstance and outside decision-making more and more as the plot progresses. I found that quite refreshing. The other thing I really enjoyed about this book was the world building. I already mentioned the fantasy plant technology, which was often pitted against “natural” solutions, creating some really interesting juxtapositions. For example, at one point Zahrah encounters a foreign people who use candles instead of plant lamps, because their society is morally opposed to technology; this was really jarring to me, because in my book it’s the candles that are the technology, and that prompted some interesting questions about the differences between natural and artificial. Additionally, the story is full of mythologies and imaginative mythical creatures based in Nigerian folk concepts, so they’re very different than what you get in a more standard YA fantasy/scifi novel, and the prose style is straightforward and to the point, allowing you to step directly into events without much interference. Plus there was a Hitchhiker’s Guide reference, and that’s never a bad thing. If you’re looking for some fun YA to read, definitely check this one out.